This is a pro-standard USA-made custom guitar and will have most rock players slavering at the bit. Superb neck. Equally impressive overall performance and tones. We've been itching to get our hands on this for many months now and the timing couldn't be better: we're writing this review on official Iron Maiden Day! As a band, Maiden were honoured with a Fender Strat back in 2001but these new axes mark the first occasion that any specific member of the six-string fusillade has been given a signature model. This Adrian Smith Signature Dinky has been released by Jackson, who are now part of the Fender family of course. The other two instruments in this series are a Fender Dave Murray Strat and a Fender Steve Harris Precision bass. In effect, all three guitars hark back to the instruments used by the respective members on 1987's Somewhere In Time tour and, although none of them are intended as a strict replica model, the spec, look and, most importantly, vibe and tone is designed to be close to the guitars on which some great rock music was played. We managed to grab a couple of minutes with Adrian on the eve of the final date of the band's recent tour to ask him what sort of input he had with this new Jackson model? "When I heard they were going to build one, I said 'Okay but send me one to try out'. They did that and I really liked it straight away: this was the ebony fingerboard model. Later I tried the maple neck model, but the neck was too fat so they modified that to my liking." And how did the original model come into being? "Grover Jackson came to a lot of the shows with different prototype guitars for me to try. I had a fifties Fender Strat that I liked, so he took measurements from that and it formed the basis for the [signature] model." The example we have here is slightly different from Smith's original, but only in that it features an ebony, rather than maple, fingerboard and a white instead of black pickguard. The remainder of the spec and feel is the same as its virtual opposite. One important difference in spec concerns the pickups. The configuration of Smith's original was h/s/h, while the 2009 model comes loaded with two Fender Samarium-Cobalt-Noiseless (SCN) single-coils to work with a now-classic DiMarzio Super Distortion in the bridge. "I'm always experimenting tonally," continues Smith. "For example, with different tunings, guitar synths and various guitars. Lately I've been trying out the classic Fender neck pickup sound. That really sounds different to what the other guitarists [in the band] are doing." An original Floyd Rose is the obvious choice of bridge, as Smith is adept at incorporating subtle vibrato as well as precise dive-bombs into his playing, while the maple and ebony neck - with 22 huge frets and a conical radius - is a rock-player's dream. The guitar's main voice, perhaps unsurprisingly, is a full-on rock tone and, using a Marshall JVM401C combo, the tone is full, distinct and dark. It's more difficult than usual to describe here, but imagine an imposing wall of sound thatnevertheless comprises six distinct strings and you're most of the way there to getting just how huge the guitar's rock tone is. The combination of both coils of the hot bridge humbucker with a single-coil, as selected by the second position of the five-way here, is always an inspirational one as you get the best of both worlds - a cool level of fat, middly beef that's encircled by some Fullerton-flavoured sparkle. 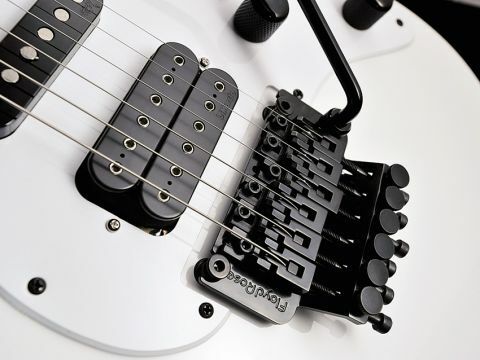 It's versatile too, with the neck pickup allowing for numerous traditional clean and crunchy tones. And we're glad to be able to report that we can see the potential of the guitar's adaptability in the hands of many players. Sure, Run To The Hills sounds brilliant, but this is certainly no one-tone pony. The ultra-low action enables you to pull off all manner of speedy solos and the overall performance is just as we'd expected - very impressive. This guitar and the Fender Dave Murray Strat are more than guitars for Maiden fans. They are great rock axes that have quality oozing from every fret. A high-end electric is still the dream that players aspire to and, if you enjoy full-blooded rock combined with more subdued styles when the occasion calls for it, either model will suit you down to the ground. Yes, both are pricey, but these are high-end US signature guitars. There are cheaper options out there, but few that rock quite as hard.The Jackson offers a neck with a feel that's totally at one with any rock player's needs. It is versatile, plays wonderfully and offers more than its fair share of impressive and individual tones.